Basundi recipe is almost the same as rabdi aka rabri, the recipe of which I had posted earlier. 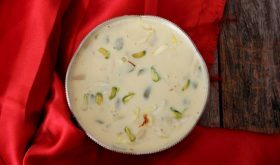 Basundi is thick sweetened milk that is flavored with cardamom or saffron and garnished with nuts like pistachios or chironji. 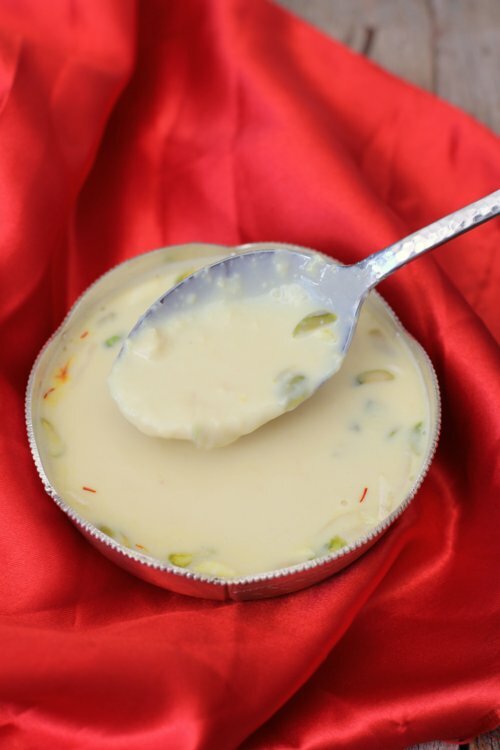 Rabri is similar to basundi but differs in texture due to the difference in the method of preparation. 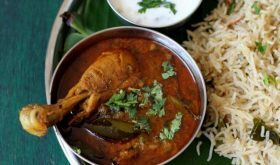 Both basundi and rabdi, call for the use of full fat milk that is slow cooked for long duration with constant stirring. For authentic basundi preparation from scratch, whole milk is reduced to a little less than two thirds of its original quantity by constant stirring till the milk thickens. It has more liquid content compared to rabdi and less milk solids. Basundi is eaten on it own, either warm or chillied and is also be served with puri or jalebi. 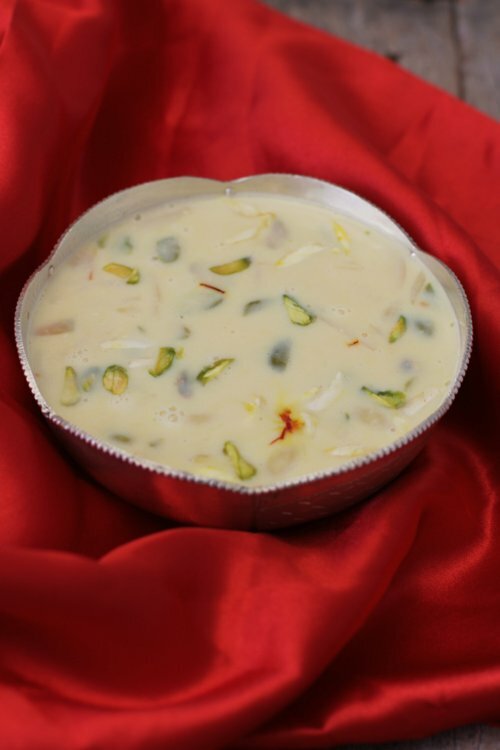 While making rabri recipe, whole milk is reduced to less than half of its original quantity. It is thick with milk solids and has minimal liquid content compared to basundi. 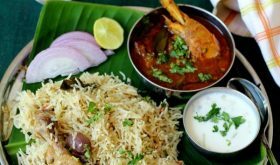 Rabri can be eaten on its own, either warm or chilled and is also served with malpua. Sliver the blanched almonds, chop the pistachios and set aside. Boil milk in a large heavy bottomed wide vessel on high flame. 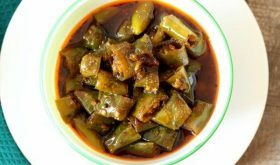 Once it comes to a boil, reduce flame to low and allow to simmer for 12-15 mts, stirring in intervals of 3 mts. Add sugar at this point and keep stirring constantly. You will see that the milk thickens. This could take 45 to 50 mts. Add cardamom powder and mix well. Turn off flame and allow to cool down slightly. Remove to a serving bowl. Garnish with the chopped nuts and saffron strands. Ladle into serving bowls and serve warm. You can even chill the rabdi and serve it chilled. 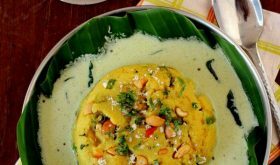 Use a heavy bottomed vessel while making basundi. Full fat milk is best for a rich, creamy flavor. You can use 2% milk but it will be less creamy. You refrigerate for 4-7 days or freeze it for a few weeks. f you are serving chilled basundi, reduce the boiling time of milk by 10-12 mts as basundi will thicken on cooling. By Sailu Published: March 2, 2015 Basundi recipe is rich, creamy, thickened milk, flavored with saffron & nuts. 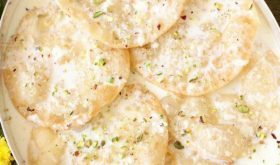 A gem among indian sweets recipes, learn how to make basundi for diwali, holi. peda into it. It tastes equally awesome.